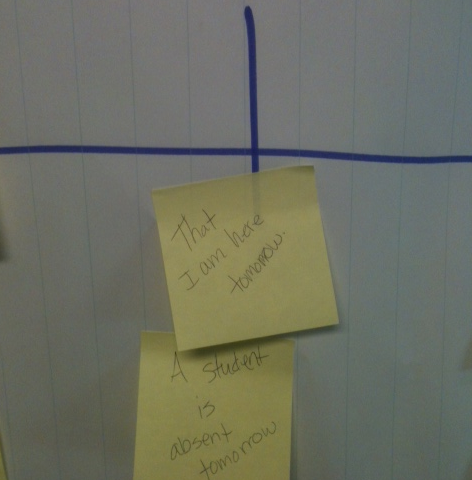 Do you ever have those days that you just TOTALLY nail the lesson? Today, that was me! I'm in a 4th grade class the next 2 days (possibly 4 if the two teachers quit fighting over me) and I got to start many new units today for writing, English, Math, and Geography. So for math, totally nailed it. I was soooo pumped after math lol. They are starting probability and we talked about the likelihood line. Some stuff is certain, likely, maybe, unlikely, and impossible. So I gave an example and we discussed examples of each. 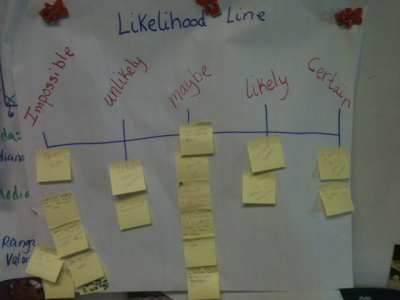 Then they got in groups and wrote with expo on their desks their own likelihood line with examples. 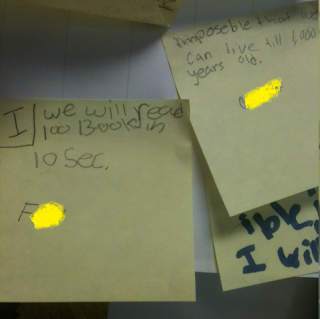 And finally, they each got a sticky note and wrote an example and posted on my line. 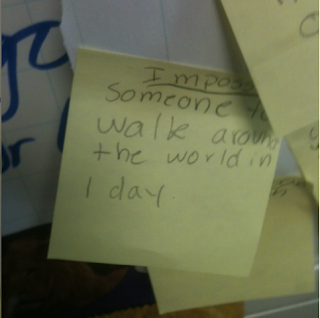 I told them it's not impossible, but it probably won't happen lol. 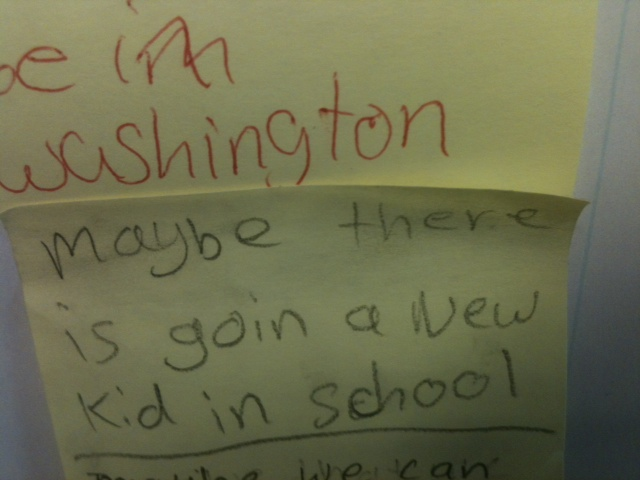 Maybe there will be a new kid in school. Good idea! They had a hard time with likely, so these are my examples. Likely that I'm there tomorrow. 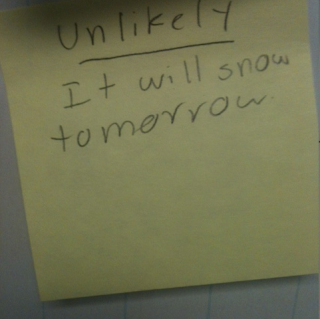 Likely a student will be absent (since so many are sick). 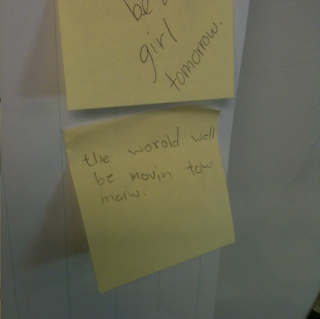 Certain I'll be a girl tomorrow and certain that the world will be moving tomorrow. Impossible to walk around the world in a day. Impossible to read 100 books in 10 seconds. Impossible that we will live until 1,000 years old. They REALLY liked the impossible aspect lol. Tomorrow I'll use it again and throw in percentages and fractions! What else rocked? Geography! 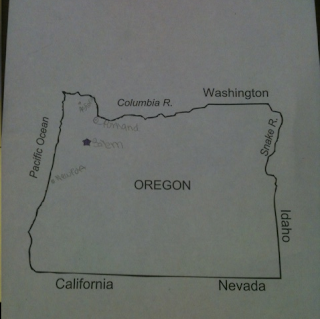 I got the pleasure of introducing Oregon <3 So I wanted to know what they know and gave them a blank map. Pretty much they all go the state. 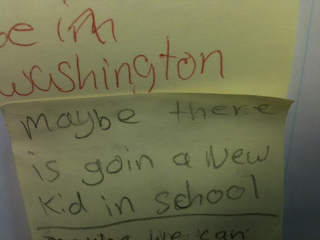 I showed them where Portland was and a few other places to get them started. Had to post this, it cracked me up. 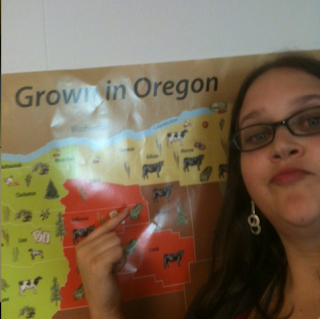 I'm grown in Oregon hahaha. Oh and ignore my pink eye please! 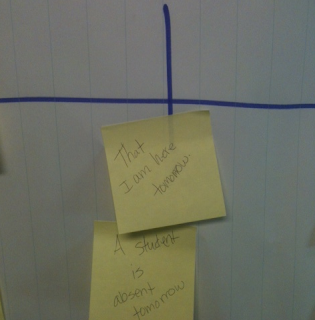 I love that feeling when you are in the teaching zone. I just wish there was some way to bottle it and make it happen more frequently. I love your lesson!